The latest version (V1.0) can be downloaded using the link later in this page. Large numbers indicate a number placed in a cell. If they are black numbers, then they are an original number of the puzzle; blue numbers represent numbers that you have placed in a cell. In its default mode, the Sudoku Aid shows a light grey grid of numbers in each cell. These numbers represent the remaining options for a given cell (based on eliminating numbers already in the row, column and "9 cell mini grid"). Clicking on a number with the left mouse button places that value into the cell (alternatively, you may press the number on the keyboard while the mouse cursor is over a cell to place or remove that number). Clicking on a number with the right mouse button "crosses out" that number indicating that you have eliminated it for that cell (refer to the graphic below). If you place a number (or clear it) by mistake, you may click the Undo menu to reverse the action. You may also use the keyboard to Undo the action - Alt+U or the Backspace key. Using the Tools menu, you can select different levels of assistance. Highlight 1 option cells (checkbox) - You can select to have the Sudoku Aid highlight cells that have only 1 option remaining for them. Note, just because there's only 1 option, doesn't necessarily mean that it's the "right" option - that depends on what you've done along the way to fill in other cells. Once a "1-option" cells appear, you may click anywhere in the cell and it will fill in with its number. Chasing these "1-option" cells can be kind of fun, but if you bore quickly with that, you can also use the little button called "Chase '1 Opt' Cells" to have the aid automatically fill these in while there are any. This button does not apply any intelligence or try to solve the puzzle, it simply "clicks" on "1-option" cells for you until there are no more "1-option" cells (sometimes this is a solved puzzle, sometimes this is a dead-end, sometimes, there's still a ways to go). Highlight 2 option cells (checkbox) - You may also choose to highlight cells that have 2 options remaining for them. This is useful for puzzle solvers that use patterns of 2-option cells to eliminate or deduce numbers for cells. Highlight dead cells (checkbox) - Dead cells are cells that end up without any options - this is normally the result of an error in solving; occasionally it's a bad puzzle, but we haven't run across any such puzzles from the more prominent providers. Dead cells can be identified by the lack of any of the little 'option' numbers in them, or if you check the "Highlight dead cells" checkbox, they will be highlighted in the specified color (default being red). Puzzle History - for most puzzles we've done to date, we haven't had to resort to "trial and error" which is what the Puzzle History is particularly good for. Should you run across a point in a puzzle in which you think you just need to "try something," that's when you should Check the "Book Mark Next Try" checkbox. Your next move will be marked in the History list so you can come back to it if it turns out to have been a dead end. (To get back to that point, you can either Undo until it's the top item - then one more Undo to clear it; alternatively, you can click on that entry in the History list and then click Undo one more time to undo it.) The Comment field simply attaches a comment to every move added to the Puzzle History. 1. When creating a new puzzle (e.g. from a paper copy, or one of your own design) - once you have all the initial numbers in the right places, save the puzzle to a file and then open the same file. This will (a) reset the puzzle history so you don't accidentally undo a number in the base puzzle, and (b) mark the numbers as being original (different color and you can't change them unless you indicate that you want to change original cells). 2. Saving and sharing puzzles - You can save puzzles onto your hard drive or network so you can enjoy them again in the future. In addition, you can email the resulting file to others that are using the Sudoku Aid. 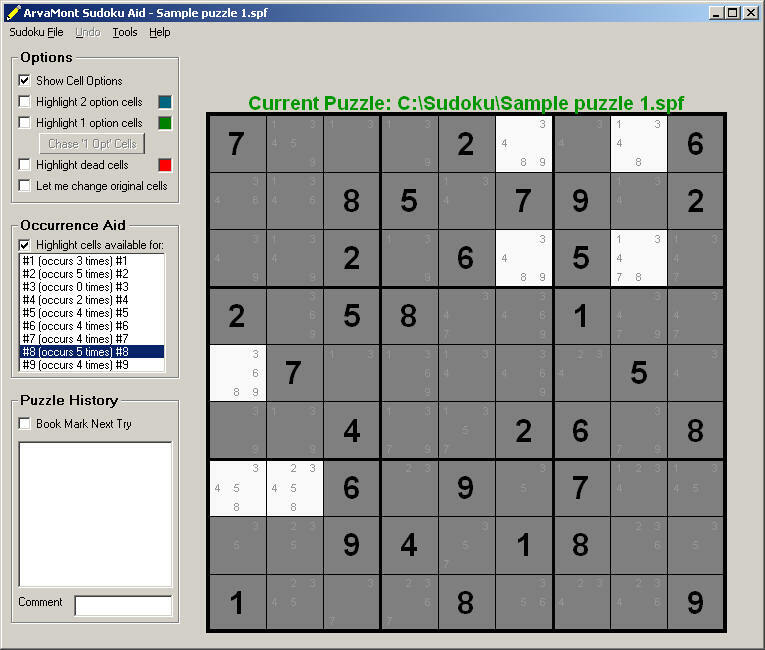 When the Sudoku Aid is configured properly, other users can simply open such a Sudoku attachment directly (or, they can save it to their hard drive and open it from there). The key is to ensure that your computer uses the Sudoku aid as the default program for files with an ".spf" extension (nothing to do with sunscreen :-) ). This can be done through Windows Explorer (Tools - Folder Options - File Types). IMPORTANT NOTE: PLEASE, RESPECT ANY COPYRIGHTS OF SUDOKU PUZZLE CREATORS - please respect their wishes on sharing, don't publish their puzzles in forums that they had not intended, and always credit the author if you are sharing a puzzle. 3. Printing - it works, but sometimes it appear to "hang" briefly when you click OK. Generally, it will work within 10-20 seconds, so bear with it for a moment before giving it the three-fingered salute (Ctl+Alt+Del). Sorry, we're still trying to figure out why this delay occurs. Download the installation executable by right clicking here and selecting "Save Target As..." in your browser. It's about 300KB, so it shouldn't take too long to download. Save it to your desktop or a temporary directory. Double click on the file you just saved (or select "Open" or "Run" if prompted by your browser - you may also need to indicate that you trust this file). You may be prompted about a "sub installation program running" - that's normal. Follow the prompts to complete the installation. Delete the file you downloaded and saved - you no longer need it once the Sudoku Aid has successfully been installed. 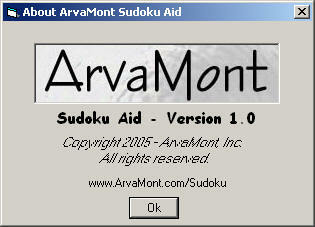 Once the installation is complete, there should be an item in your Programs menu that lets you launch the Sudoku Aid. In addition, you should be able to double click on Sudoku Puzzle Files (.spf extension) and open them directly in the Sudoku Aid. This makes it easy to open puzzles that you have saved, or to open puzzles that others send you via email.